Today is the last day to register for JEE Main April 2019. Interested candidates need to submit an online application from at jeemain.nic.in before 11:50 PM. 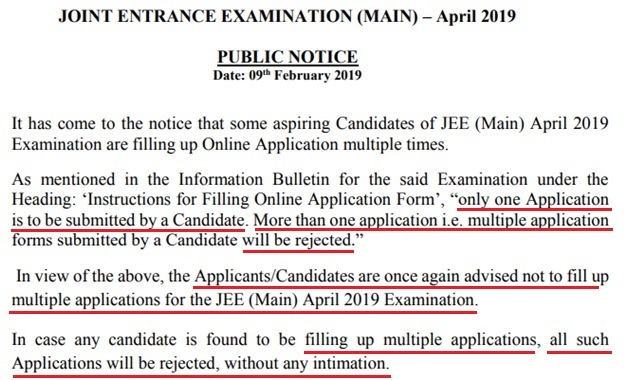 Students who have already submitted the JEE Main Application Form 2019 should not apply again. In case any candidate is found to be filling up multiple applications, all such Applications will be rejected, without any intimation. Check here the stepwise procedure to submit online application form for the April session of JEE Main 2019. With the decision of the national testing agency (NTA) to conduct JEE Main 2019 twice a year, students have another chance to fulfill their dream of getting top engineering college. The JEE Main January 2019 exam has been successfully concluded by the national testing agency between 8 and 12 in 10 shifts. Engineering aspirant can reappear for JEE Main 2019 as the exam will be conducted again in April month. 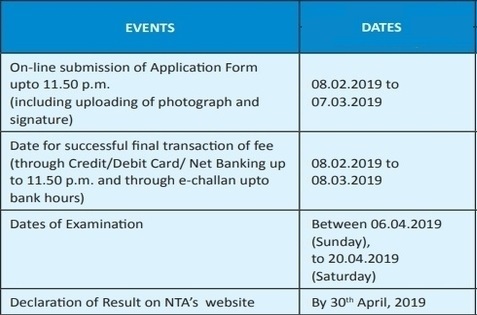 After the JEE Main April 2019 Exam, the all India of ranking of candidates will be released taking into consideration better of the two NTA Scores of all candidates appeared in Jan 2019 and April 2019 examinations. Candidates who want to reappear for the national level engineering entrance exam i.e. JEE Main 2019 can apply before the last date of application i.e. March 7. Those who want to appear for JEE 2019 should have complete knowledge on how to fill the application form of JEE Main 2019. Candidates can check here how to JEE Main 2019 application form including registration, filling up the form and other instructions in this article. Candidates appearing in class 12th or any equivalent qualifying exam in 2019 and even, candidates who have passed class 12th or any other equivalent qualifying exam in the year 2017 or 2018 are eligible for JEE Main 2019. There is no age limit for the candidates for appearing in the JEE Main 2019. Related Video: How to select the best coaching for JEE Main 2019 preparation? 1. Registration -You need to log in to the official website www.jeemain.nic.in and click on 'Fill Application Form' link. Read the given instructions carefully and click on the check box to proceed further. Fill all the required information like state of eligibility, nationality, identification type, gender, Aadhaar card number and security pin etc. any other valid Government identity number. 2. Fill up the application form - Now the candidates have to fill the application details of JEE Main like applying for, mode of examination, exam centre and exam medium. You have to fill the personal details like name, father’s name etc, academic details like year of passing grade 10th and 12th, percentage of 12th grade. Have to mention the mailing address details and guardian details. Create a password, enter a security pin and enter the next button. Before submitting the form, cross-check if you need to edit your previous information. Proceed further after that by entering the submit button. 3. Uploading Documents - Now, the candidates have to upload the scanned images of photographs and signature. (i) Photograph has to be colored passport size with name and date and it should be more than 10 kb or less than 200 kb. (ii) It should be scanned and should be in jpg or JPEG format of the size 3.5 × 4.5 cm. (i) It has to be done on white paper and should be done by the candidate. (ii) The signature has to be done inside the box of 3.5 × 4.5 cm. (iii) Scan the image of the signature and it should be more than 4 kb and less than 30 kb in size. 4. Fee Payment - Now, click on “Pay exam fee” link to pay the fees. 5. 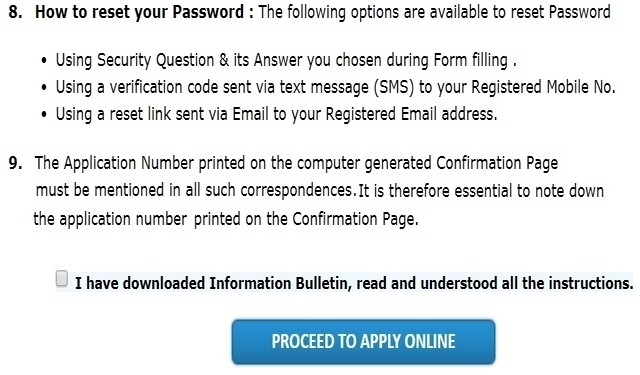 Download confirmation page - Candidate will receive the acknowledgement page after the successful payment of the fees. Take out its printout for future prospective. In case the acknowledgement page is not generated, that means that transaction gets cancelled. Then, money will be refunded to the candidate’s account in 7 to 8 working days and candidate have to do the transaction again.